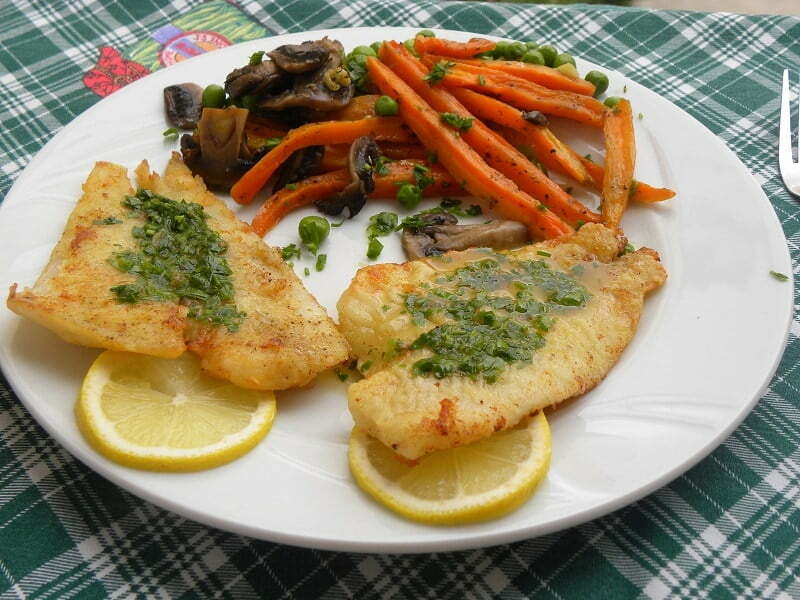 Sole Meunière is one of the most easy and delicious fish recipes from the French Cuisine. Filleted sole fish is sauteed and served with a buttery sauce. Sole is a flatfish belonging to the family of soleidae. There are many types of Sole fish such as the common or Dover Sole, Solea solea, the American soles, Archidrae, the tonguefishes, Cynoglossidae, etc. In this recipe I used the frozen yellowfin sole (Limanda aspera). If you are using a fresh Sole fish you can either fry it whole or fillet the fish. To fillet the fish you will need a sharp filleting knife and a pair of scissors (optional). It goes without saying that you have to scale and gut the fish first. ⇒ With the scissors (or sharp knife) cut the dorsal and ventral fins which are around the fish. Also cut the fins which are under the gills (pectoral fin). ⇒Make a cut at the edge of the tail, grab the skin and pull toward the head to remove it. ⇒ While pulling the skin, gently press the revealed flesh with your other hand so that it does not tear off. ⇒ Turn the fish over and do the same on the other side. ⇒ Slide the knife along the backbone to remove the flesh and carefully move your knife back and forth in a sawing motion, moving it along the spine down toward the head. ⇒Repeat on the other side. ⇒ Wash the fillets and pat dry with kitchen paper. If you are using frozen sole the procedure is much easier. Just thaw from the previous day, in the fridge, pat dry with kitchen paper and proceed to the instructions for cooking the fish. Meunière refers to the sauce made after pan frying the fish. Meunier in French means “miller” and meunière is a female miller, who probably invented this recipe. So, à la meunière refers to the method of preparing the fish by dredging it into flour and then frying or sauteing it, preferably in butter. Several decades back, I remember an old friend of mine, who came from an aristocratic family and would cook sole fish frequently. At the time I had never eaten sole fish before nor did I know how to cook it. I remember she would say that sole fish should always be sautéed in butter. During the first years I would follow her advice but now, I used a combination of butter and olive oil to fry the fish but I do make the sauce using only butter. ⇓The sole fillets should be dredged in flour the last minute, otherwise the flour will absorb humidity and will not result into a crispy crust. ⇓Shake off excess flour as otherwise the butter will burn easily. ⇓If you are sautéing too many fillets, the oil may burn because of the flour. In that case, wipe it off with kitchen paper and add some fresh butter. ⇓Butter can be used as it is or use clarifed butter. ⇓The same recipe can be made with trout or other white fleshed fish. ⇓You can serve the fish with potatoes, rice of vegetables. ⇓After filleting the fish, you have the head, the backbone and the tail in one piece. Do not discard them as you can boil them and pass them through a sieve to get the broth to make fish soup or use it in other recipes. I served the sole fish with some roasted carrots, mushrooms and peas. The peas were boiled for five minutes and drained. In a clean frying pan I added 2 tbsp olive oil and fried some chopped mushrooms for 3 – 5 minutes. The peas and the mushrooms were then mixed in the roasted carrots and seasoned with more salt, pepper and oregano. Fillet the fish as above of if frozen sole fillets are used, thaw them from the previous night, preferable in the fridge. Season them with salt and black pepper. Put the flour in a large shallow bowl and dredge the fish on both sides. Shake off any excess flour. Heat the butter and oil in a large frying pan. Add the fish and cook for 3 – 5 minutes (or until browned) before turning over. Turn the fish only once using a spatula and cook the other side for 3 - 5 mins until golden. Remove the fish to a platter with kitchen paper to absorb the excess oil. Repeat with the other fillets. If the butter with oil looks black, wipe out the pan with kitchen paper. Return the pan to the heat, then add the butter. Heat until the melts and begins to turn a light brown, then mix in the lemon juice and the parsley. Put the fish in a platter and add the sauce on top. Heat the water and cook the peas for 5 minutes. Drain and set aside. Heat the olive oil and sauté the mushrooms for 3 – 5 minutes. Mix the peas and the mushrooms in the carrots and season to taste. You can also serve the fish with mashed potatoes or rice. The sole fish looks really really fresh and even that side dish looks fantastic! An excellent dish, Ivy. I love fish. Thanks for sharing this amazing recipe.